ArtNetGallery - A web gallery for contemporary art!! 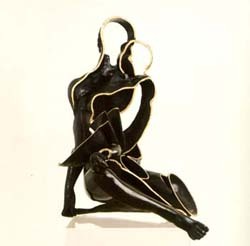 Arman (Armand Pierre Fernadez) was born in Nice in France in 1928. His father, who was an immigrant from N-Africa, was an autodidact artist and inspired and gave Arman the first lessons in painting. At first his works were abstract traditional paintings, but at a group exhibition in Paris in 1954 Arman for the first time presented abstract images or forms made by rubber stamps that he found in his fathers office. The new style of collected items or images of items in groups has continued in many of his future work. 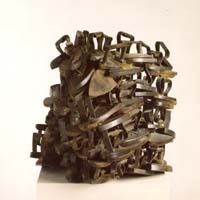 Arman has shown in his work a passion for objects - objects which are worthless for the general public. 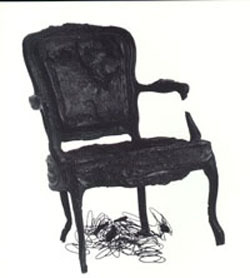 During the 1970:ies Arman collected "garbage" items and formed sculptures, usually in bronze. A good example of this is Holm´s accumulation left, were he sampled flat-irons in a bronze sculpture. Arman wanted by this to demonstrate against the useless wastage of "unfashionable" items in the consumption society of the 1960- and 1970:ies. 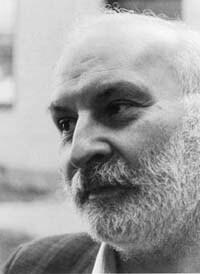 Arman made also several graphical works dedicated to this theme of social criticism. There are some very good examples on display in the ArtNetGallery: Le masque a gaz, Le transistors and Le Telefone. One was burning old furniture and making bronze casts of the items (Pompei´s syndrome, left). 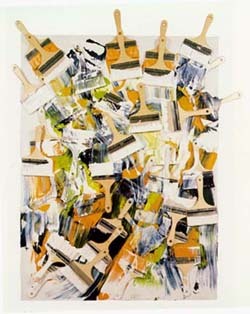 Although this "day-after-art" was emphasizing the same theme as during the 1970:ies, still the total destruction of "accepted" items did not have the same impression as when making works from garbage items. The other technique Arman focused on during the 1980:ies were bronze statues of ancient gods and goddesses or from demolished items that he remodelled. The fiddle was a frequent object of concern as shown left (Yasmin´s Violon). The reconstruction of the demolished items often gave the impression of a life and moving object. 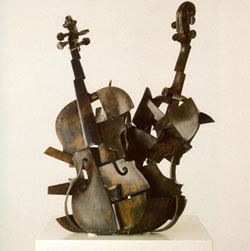 Bronze casts of these items were sometimes made in limited number - an example is the Violons, which is on display and for sale in the ArtNetGallery. Some of the graphical works from that time gave the same impression of movement like Untitled, also on display in the ArtNetGallery. The statues of goddess or god were usually during the 1980:ies cut in slices and resampled in a three dimensional sculpture. The style might be called neo-cubism sculpture. A good example is Hera on the left from 1986. During the late 1980:ies and early 1990, Arman turned to making large wall pieces of demolished items for example plates of china. Large wall-pieces with colour-tubes or pencils were also common items - an example of this is seen in Bataille from 1989 (left). Although the works of Arman have an accusing social conscious impression, still the resampled items do not make the observer feel quilty, but instead give you the feeling of content and pleasure. This especially when you see young people who were born during the 1970:ies and who appreciate furniture and items from the 1950- and 1960:ies.